Katherine Hoffmann, an X-ray crystallographer and pioneer in the use of a technique called isothermal titration calorimetry that measures the energetics of protein behavior, is leading the project. (THOUSAND OAKS, Calif. – Sept. 8, 2017) The National Science Foundation awarded two members of the California Lutheran University faculty a $195,000 grant to work with undergraduate students to research proteins that enable pathogenic bacteria to thrive. Katherine Hoffmann, the John Stauffer Professor of Analytical Chemistry, and Jason Kingsbury, an assistant professor of organic chemistry, are the principal investigators for the three-year project. They received the grant through a program that funds research at predominantly undergraduate institutions. Each year starting in 2018, the grant will provide fellowships to two students working with Hoffmann and one student working with Kingsbury, and will cover the cost of laboratory materials. The university is covering the cost for additional students to participate in the research, which is already underway. The students and faculty members will use state-of-the-art techniques practiced at national labs including X-ray crystallography and high-field nuclear magnetic resonance spectroscopy. The students will also participate in national science conferences and potentially have their peer-reviewed manuscripts published. The Cal Lutheran team is researching the structure and behavior of an understudied family of proteins called NIS synthetases. These proteins are involved in the creation of small iron-binding metabolites that enable the most virulent pathogenic bacteria, such as staph or anthrax, to steal the iron they need to function optimally from humans. Without the ability to scavenge iron, the bacteria would perish. The research will lay a foundation for the possible development of antibiotics that interrupt this iron acquisition. Drug resistance in virulent bacteria has grown so remarkably during the past several decades that the need for new antibiotic agents is reaching a critical point. Hoffmann, an X-ray crystallographer and pioneer in the use of a technique called isothermal titration calorimetry that measures the energetics of protein behavior and will be used in the research, is leading the project. Kingsbury, an expert in multistep organic synthesis, and his students will work to provide Hoffmann’s lab with the substrate molecules they need for the protein research. Hoffmann, an Oak View resident, earned a doctorate in biochemistry and molecular biology from Oregon Health and Sciences University. Kingsbury, an Agoura Hills resident, holds a doctorate in chemistry from Boston College. 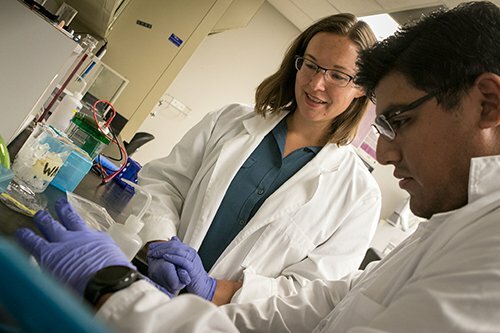 More than 90 percent of chemistry majors at Cal Lutheran participate in research with faculty members. Recruited as early as freshman year, students take on progressively more independent projects as they gain experience. About one-third of Cal Lutheran chemistry majors go on to graduate school. Another one-third go into teaching, and the final third go directly into another job.